IRANIANS SPEAK TO ISRAELI PAPER: HELLO, IRAN SPEAKING……… – The Tundra Tabloids……. 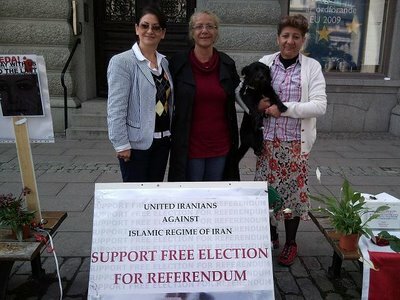 This picture of pro-Western Iranians was taken by myself in Stockholm in the summer of 2009, right across from the Swedish house of parliament. These are the types of wonderful Iranians that the world should get to know. They were absolute in their desire for a liberal type democracy that is modeled after the ones in the West, they loathed Islam and socialism as much as they loved the US, Israel and free market capitalism. My kind of folks. While in Israel we are preoccupied with threats and preparations for a possible strike on Iran’s nuclear sites, residents of Tehran, Esfahan, Shiraz and other Iranian cities are already deep into another war – the war for their survival. Phone calls made in recent days by Yedioth Ahronoth to several Iranian citizens revealed a fascinating picture of the enemy state that hides behind the scary rhetoric of the leaders from Tehran. While top Iranian leaders Ali Khamenei and Mahmoud Ahmadinejad boast that Western sanctions merely make Iran stronger and issue statements claiming Iran’s home front is resilient, the Iranians we spoke with have other news – the situation in the country is terrible. In recent weeks, the local currency depreciated dramatically, the prices of goods skyrocketed, and inflation has spun out of control. Meanwhile, the government has minimized fuel subsidies and encourages residents to walk or use public transportation. “We’re eating less meat, whose price went up significantly, and settle for staples. It’s good for our health. Maybe the Americans want all of us to go on a diet,” he quips, bitterly. Previous Post Previous Post OFFICIAL VEHICLE OF THE COUNTERJIHAD……..
3. That same language gives them a link to Persia’s native faith – Zoroastrianism.